The 15-member OPEC (The Organisation of the Petroleum Exporting Countries) cartel pumped 32.98 million barrels per day last month. The rise in production was last matched in October 2017. OPEC countries have finally started increasing production. As supply cuts are reversed, OPEC's crude oil production in August (excluding Congo, which joined OPEC in June) rose to a 10-month high. The 15-member OPEC (The Organisation of the Petroleum Exporting Countries) cartel pumped 32.98 million barrels per day last month. The rise in production was last matched in October 2017 (32.57 million b/d) as per S&P Global Platts survey. Saudi Arabia, which is the world's largest crude exporter, pumped 10.49 million barrels per day in August. This is far above the production that was agreed as per the supply cut agreement of last year. Saudi Arabia's oil production could rise to the level of 11 million barrels per day if the demand sustains. 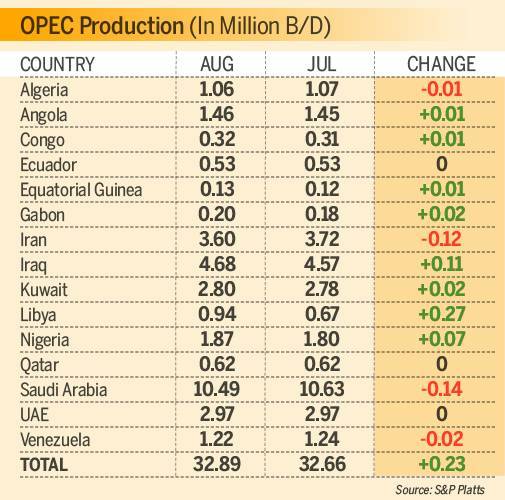 Here are the production numbers of the OPEC countries in the past two months. Iran, which is facing sanctions by the US, saw its August production falling by 120,000 barrels per day. China and India has also significantly cut oil imports from Iran. Only 3.60 million barrels per day was produced in the country, which represents the lowest in more than two years. Now the monitoring committee overseeing the OPEC/non-OPEC supply accord will meet on September 23 in Algiers (Algeria) to examine market fundamentals and potentially make recommendations on the output policy.